The Legislative Conference is the largest advocacy gathering of dermatologists and patient advocates in the country. The conference serves as an opportunity to discuss the issues facing our specialty and patients, and present them to Congress in a unified voice. The Conference offers a unique blend of didactic and interactive advocacy sessions, political debates and the opportunity to directly lobby your Members of Congress. Conference attendees learn about critical health policy issues from national health policy experts, political insiders and AADA advocacy leaders. However, the most powerful aspect of the Conference is your ability to advocate on behalf of the patients you represent. With patient access to quality health care being a top priority for the AADA, we want to ensure patients’ personal stories are being heard on Capitol Hill. The AADA will provide 3-nights hotel stay for two designated representatives from each organization; additional nights at the hotel may be booked, based on availability, but will not be covered by the AADA. All hotel arrangements are made by AADA staff, based on information included on the registration form. Hotel confirmations will be sent by AADA staff two weeks prior to the meeting. A credit card deposit will be required upon check in for incidentals. The AADA will cover travel expenses for two designated representatives from each organization. Flight reservations can be made through the AADA travel website or on your own and submitted for reimbursement following the Conference. You will need to arrange for ground transportation to and from the airport. These expenses will be reimbursed to you after the Conference. Please do not rent a car, utilize cab and Uber services. Transportation to Capitol Hill will be provided. The Academy’s official travel agency is Fox World Travel. If this is your first time using Fox Travel please click here and set up a profile. Allow 24 hours for profiles to be accepted, you will receive an email when it is approved. Once in the Concur booking system, www.concursolutions.com when prompted, you will need to enter the Cost Center Code for the 2018 Legislative Conference 03-75-3536002-000. Be sure to follow through all the confirmation pages until you see Finished! at the top of your screen. Travel reservations made through Fox World Travel will be billed directly to the Academy. Upon confirmation of your purchase you will receive an e-ticket confirmation via email. The Legislative Conference will begin on Sunday afternoon, and will adjourn by 5:00pm on Tuesday. AADA staff is in the process of developing comprehensive and effective sessions for the 2019 Conference. 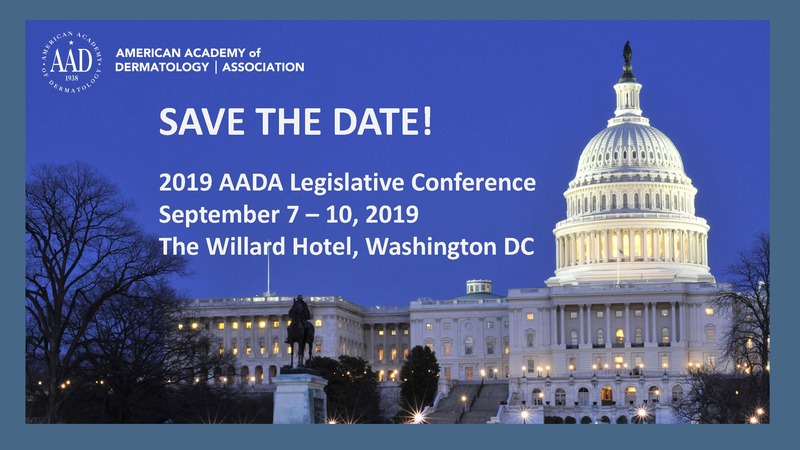 The program will contain break-out groups that will involve hands-on training and role-playing from outside professionals, AADA staff, and experienced member advocates which will focus on providing education on the “legislative asks”. There will be a dinner for CSD attendees is on Monday. On the final day of the Conference, attendees will meet with their members of Congress, with a small group of attendees from their home state. Capitol Hill meetings are scheduled by an outside consultant and schedules for those meetings will not be available until the week before the meeting, via email. Understanding that flights will be booked in advance, we encourage attendees to book their flight after 3pm (EST) on Tuesday. If for some reason your flight is scheduled before a meeting on Tuesday, our consultants will do their best to reschedule, but cannot guarantee changes.